Ladies and gentleman, please say a big hello to our latest Q&A guest, the incredibly talented Mr Sam Littlemore. 1/3 of Aussie dance music legends Pnau, Sam’s production/writing and remix CV is second to none. Robbie Williams, Peking Duk, Gwen Stefani, Nellee Hooper, Rick Nowels, Nelly Furtado, The Potbellez, Kaskade, Freestylers, Sneaky Sound System, Gus Gus, TV Rock, The Similou, P. Diddy/Kelis, Empire of the Sun, Cassidy, Ladytron, The Doors, ESG, Mutiny and Random House Project/Robert Owens. This list goes on and on. I know the whole group will join me and in saying a big hello and thank you for joining us for a Q&A. Q: Klaus Hill i’ll get started….what’s you current DAW of choice? Whats your current top 3 plugins? And care to share 1 production tip? A: Sam Littlemore DAW is Pro Tools on a 2015 MBP. Top 3 plug-ins may be UVI Falcon, FabFilter Saturn & H-EQ. 1 production tip – get to know your waveforms. Sam Littlemore I’m all ITB but I’m currently building a studio (my first) and hope to get some analogue & FM synths. Lucas Reid that’s hectic man, would not have guess ITB. have you favoured any specific headphones over the years or use a subpak etc. Q: Klaus Hill How does the Pnau writing process work? I know you’re based here in Sydney, with the others in LA. Is there a lot of work done online? A: Sam Littlemore I spend a few months each year in LA working on Pnau. We don’t do a lot online as I think the collaborative space is so valuable. I prefer starting with Nick’s demos to give us a seed as he writes everyday, works fast and has a punk attitude at heart. Pete works in conjunction with Nick to ensure his ideas are somewhat in tune and structured. I get involved once i can hear a potential hit and try not to kill it. Q: Christian Pillot Thanks for doing this Sam. 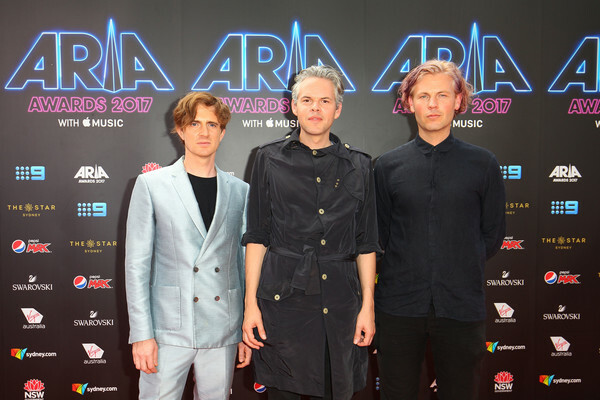 What inspired the direction for the latest pnau album? A: Sam Littlemore Conceptually, Changa is pretty well documented as a DMT inspired album but from a production POV, our influences were 80s electro & 90s acid-house. Q: Ian V Jones I’ve heard you referred to as the “hit maker” in certain circles. And that you have the ear to add that last piece of magic to a track that somehow lifts it far beyond what the artist expected. And all the tracks you’ve had a part in reflect this. What advice would you offer to a producer wanting to add magic to a track? Is it just a case of being brave and trusting your instincts or is it a more clinical process? Sam Littlemore The clinical aspects of music-making are very time-consuming. I spend a lot of time recreating every sound in a track, trying to increase the resolution, so to speak. If I hear harmonics that are out of tune or unresolved, I will add those in to increase the payoff. The most important thing I do however is trust my instinct when choosing which songs to work with. I have certainly made the mistake of working on songs for the money rather than the love. Ian V Jones Sam Littlemore thanks Sam! This is awesome! Sam Littlemore As far as advice goes, I’d say take your time perfecting each half bar loop. Phase-shift everything so that there’s a hierarchy from high frequency parts down to the sub bass to maximise impact without compromising the groove. Ian V Jones Sam Littlemore I can only speak for myself, but I’m guilty of rushing thinking everything has to be done at lightening speed. It’s good to be reminded that “Putting in the effort” is still an excellent rule to follow. Thanks again man. Really appreciated. Scott Stevenson Sam Littlemore would you mind please expanding on this a little bit pretty please. I’m also not sure what you mean by phase shifting, thanks, Scott. Sam Littlemore By phase-shifting I mean moving things to the left or right to change where they sit in time relative to the other elements on the same beat. The loudest sound your speaker can make is a square wave going from high pitch to low pitch very quickly. I’m talking about using that concept to inform the placement of parts on a beat. E.g. A hi-hat hit might precede a conga hit, which precedes a bass pluck and then a piano stab, leaving just the sub bass and reverb at the end. With that kind of phase-shifting, you can master loudness and increase the dynamics of your mix beyond the norm. Generally, choosing great sounds and giving each sound its own space in the final waveform gives the biggest and best sounding mixes. Scott Stevenson Sam Littlemore thank you !! Q: Ace Cooper What was it like Dealing with the Copyright issues with Sambanova when you guys were still in your infancy? Were you scared? And was it the impacting factor that led your music becoming much less sampled based? Or was what you were doing just in line with the era? A: Sam Littlemore I was barely involved in Sambanova but I did try to get the lads to replace the samples, unsuccessfully. For example, “need your lovin’ baby” was a recognisable vocal that I helped them vocoder to mask its identity. Sam Littlemore It’s worth noting that they were making psy-trance before they had a sampler, so getting an MPC and stealing loops from 70s vinyl was a huge leap from where they’d been. Thankfully. Q : Julian Rich I’d love to know about pretty much anything you can tell me in regards to production on ‘Embrace’. Synths, instruments, how it all came about etc. It’s one of my all time favourite tracks! A: Sam Littlemore It’s a little hard to remember but I think we used a bass guitar sample from Nick’s original demo, doubled with a factory Fairlight bass sample (phase aligned). There is a sampled MKS-80 or Oberheim saw pad playing the chorus riff. The beats are sampled from a bunch of 12” electroclash records of the time. Possibly the most useful anecdote however is that, along with the whole record, it was mixed on $5 Woolworths PC speakers with the bass checked in my dad’s Volvo. A: Franky Tapia What are your top 3 favorite records you have produced or had a hands in the production side of things? A: Sam Littlemore Hey man! A pretty arbitrary list but possibly Chameleon – Pnau, What You Waitin’ For – Gwen Stefani and We Run The Nite – Tonite Only. Lucas Reid it definitely shows in everything ive heard man! its clear that everything sits in its own space etc thanks heaps for such a detailed reply too. if i could push any further with this question, do you have any sort’ve go to chains for processing the two? or routings that help like compressing the drums and bass together etc? Sam Littlemore I don’t compress the drum / bass group together. In fact, there’s never anything on those tracks in the mix. I’m always bouncing down to stems so that I can see the waveform, check the phase and see how it all fits together. Doing things in your own wrong way gives you a unique sound, so I try to be wrong. Jeff Vader Sam Littlemore I find that “sound” is so important to dance music. While you say that you don’t compress the bass and kick together and that you have nothing on those channels, are you instead doing compression, saturation or sound design on the bass and kick as you go and bouncing that down ? Or really doing no compression of the bass and kick at all even in the mixing stage ? Sam Littlemore I will often compress as part of the waveform shaping but do most of it manually, note-by-note, drawing fades in for side-chain and cross fading between processed and un-processed passes. The more pure I can maintain my preferred bass waveform, the better it sounds to my ears, or more importantly, the better it feels in my chest. A: Sam Littlemore Saffron, by far! And what was that fish dish? John Dory? Sublime. A: Sam Littlemore Hey Wayne, great question. This is damn hard to overcome and I have aborted dozens of my own songs for this very reason. The only advice I can offer is what has worked for me. I would say get as far as you can in the 1st session, writing and recording every part you can think of and perform yourself. The staleness sets in from the 2nd session, in my experience. If you end up labouring over something and it becomes too hard, split your ownership and turn it into a collaboration. It will sound fresh to someone else and maybe you weren’t going to finish it anyway! A: Sam Littlemore For an intro, I like to take the signature sound and modulate it in a unique way. Bass works really well for this as it builds anticipation and energy, foreshadowing the drop. For a drop, it’s all about that signature sound or concept. Thinking outside the box is obviously where the rewards lie but I’m lazy so I will usually find a trick that someone else has used successfully and remake it poorly. Once I have made it work musically and conceptually, I then apply refinement tricks to try to make it sound better and different to the idea that I ripped. Q: Jamie Young Hey Sam, in reference to Klaus’s how do you guys split the work load between each other? How do you guys settle on disagreements or do you guys generally agree on decisions? Keen to know the dynamic of a group of producers as to how everyone’s figured out their spot in the production process. A: Sam Littlemore In Pnau? We’re effectively all brothers, so we fight like brothers. There is very little agreement as we’re such different people which possibly pushes us harder to find the best solutions. It generally means we each make a finished version of each song to our individual taste and then try to put all the best bits into one. The workload is heavily weighted on Nick for weirdness, lyrics and vibe whilst Pete and I handle the music, production and mixing. I’ve been a huge fan of yours over the years and I still play some of your classic Remixes out when I can (eg: Honey / Lovers Electric). What is your personal favourite production of your own? And what’s the record of yours that makes you cringe the most / that you enjoy the least? A: Sam Littlemore Hey Callum, congrats man! Happy to advise anytime, I’m surprised anyone listens to me. I really love the Lovers Electric mixes, so let’s say that for now. Callum Reid Legend! Thanks heaps mate! Q: Tom Ignatius Do you write tracks based on a written narrative or through the textures of your sound design? A: Sam Littlemore Concept is key and I really try to get that happening early on. I did some songwriting with Example and was so impressed that he had an album title, all his song titles and most of the lyrics penned before anything was recorded. I think that’s a brilliant system even if it takes some of the madness out of the creative process. Tom Ignatius Sam Littlemore Thats cool. I’ve never thought to start from that side of the pond. Cheers brother. Q: Robbie Swan Is there a way I can do an official remix of “I Wish It Could Last” or at least get the stems and do an unofficial remix of the tune? A: Sam Littlemore I’ll try to dig up the stems although I have no idea which drive they may be on! Robbie Swan thanks so much man! Its just such a classic tune!! One day I want to headline tomorrowland, one of my biggest dreams and im never going to give up producing or djing, i want to start my headline with that track, its such a beautiful gem that should be so much more mainstream today than ever!! Q: Kieran Tsipidis Favourite sample library? Also, advise for developing your own artistic/sonic sound ? A: Sam Littlemore My favourite sample library would be that which I’ve made myself. I have spent years stealing bits from certain records and then redrawing the waveforms to make them longer, louder and higher resolution. I don’t like using commercial libraries, usually because they don’t sound good enough. In terms of developing your own sound, I’d say you just need to research deep into the underground. I have learnt much from the sounds of the 80s. My goldmines have been Belgian industrial music (EBM), 80s acid-house and 70s electronica. It’s important to find the seeds that inspired your favourite artists, often going back decades. Once you’ve found the originators of a certain sound or idea, ripping them off in your own way is a great way to sound unique yet inspired by your idols. A: Sam Littlemore Hey Carl, I think mastering is becoming increasingly integrated into mixing but is a real cherry on top that I still very much appreciate. I love Mike Marsh in the UK and our very own Klaus here in Oz. I usually just trust the mastering engineers and they’re almost always right. In terms of vocals, Kira is generally stacked 10-20 times, which is a very easy way to get a vocal sounding huge and has the advantage of minimising the amount of tuning required. Ivan Gough Comping and tuning vocals can drive you to the bottle real quick! Q: Madisson Dent Hey Sam!!! What hardware do you love best and/or use the most in terms of producing? Do you use many modular synths at all? A: Sam Littlemore Hey Madisson, I love 80s keyboards for kids. They’re generally FM and really noisy but sound great in a mix. I think modular synths are overrated unless you’re Tomita! Sam Littlemore Madisson Dent you don’t need many toys to be productive. I met Andre 3000 when I was in the studio with Gwen Stefani. He only ever used an MPC 3000 and a Juno 60 but was a master of his equipment. Ivan Gough I remember Prydz telling me he made most of his early records on a super old PC laptop with Logic 5 on it and almost no 3rd party plug ins. Q: Ivan Gough Hey Sam great to see you here sharing your knowledge! I’d love to know your thoughts on simplicity in songs. I’ve always felt that simplicity is a big part of a hit record. As such I spend a lot of time with artists throwing out unnecessary elements to get to the “key” of the song, then rebuild from there. Is this something you do, and if so how do you approach it? A: Sam Littlemore Hey Ivan! Great to be able to chat about this stuff, hopefully it’s useful to some. I think you’re spot on with the simplicity, and like a hit record itself, it’s a struggle to maintain. Nellee Hooper was great at this as captain of the mute button. I should be more aware of this and therefore more procedural about it, thanks for the reminder. I suppose I think of the song as an amorphous whole rather than a bunch of discreet elements. For a lot of the Pnau stuff, one approach we tried was to make loops that we’d want to sample. We eventually gave up on that though and started recreating acid-house records which was much easier and better for the songs. In order to simplify our decision making, we emulated the production process that the acid-house guys would have followed at the time. Ivan Gough There’s also something in those acid house records, especially the old ones. Because of the limitations at the time on gear, fx, channels, etc.. meant you had to learn to work in a restricted environment and get more out of less. Q: Garry Lindsay How do you get through the I cannot be bothered phase when working for clients? A: Sam Littlemore Great question. To motivate me to stay on a job until it’s finished, I make sure I only get the other 50% of the fee and whatever royalty I may have negotiated if I finish the job to our mutual satisfaction. I enjoy having clients who know what they’re talking about helping me while I work – it keeps me focused. It really pays to be selective of your clients and why I try to work with artists directly rather than through management and labels. Robbie Swan Working with artists directly is so much better! I rather vibe of people when I collab! Q: Scott Stevenson Hi Sam, what do you think you would ask if you were Sam 10 years ago ? A: Sam Littlemore I would have asked about how to make money in this business and my answer would be by playing lots of gigs and getting your music used on car ads. Q: Cam Munners Hi Sam, What’s the best way to monetize remixing. I’ve done quite a few and had some commercial success but I never pushed for an upfront production fee and never got a look-in on publishing – so effectively I did them for free in the hope of exposure. Do I keep going for little to no money in the hope a remix gets me big accolades (and then start charging) or do I try and put my foot down and cut a better deal before too much time is committed to the project? I don’t want my desire for payment for my time to close doors to potential opportunities. Thanks – BTW Love your work! A: Sam Littlemore Hey Cam, good question man. I would say it should only take one great remix to establish you as offering a good ROI from a record label’s perspective. For a case study, compare the original mix of Disclosure feat. Eliza Doolittle – You & Me to the Flume remix. This is what you should aim for in terms of a statement and indeed, be prepared to not make much on the first one or two. Consider spending a month or two on it to try to make something truly spectacular. Q: Darcy Stephens Hey Sam, Do you do anything to keep motivated production wise? A: Sam Littlemore Hey Darcy, I am always listening out for new electronic sounds but don’t chase genres. Generally, if anything is good enough, it will be playing everywhere, so it will come to me. In terms of motivation, I find pleasure bringing new songs to life by maximising the energy and payoff of song through production. My greatest motivation however is in collaboration, so I try to team up with someone who has a voice that needs to be heard, ADHD and a punk attitude. Q: Carl Freeman Hi Sam, is this Concrete Beach where you mixed Changa, or was it another studio? thanks again really appreciate the insight across this post. A: Sam Littlemore Hey Carl, there’s not a lot of mixing going on anymore, it’s mostly just production then turning everything up to full volume. We did the vast majority of the production at Peter Mayes’ studio in downtown LA. I don’t know if he has given it a name but it’s mostly used for Pnau and Empire of the Sun. Q: Chris Sciacca I’ve preferred the ideas I tend to create when I am traveling or away from home, with minimal external distractions (ie equipment, work, people and the added bs) So what are your best tips for production and travel at the same time?? + what is your recommended choice of monitor headphones?? A: Sam Littlemore I think this is quite relevant to the creative process and possibly why a trance state is a great place from which to create. A lot of songwriters and producers use weed to get into and stay in the zone but working holidays sound healthier! I do love being able to work in exotic locations, it’s my greatest luxury. I can only recommend what I do – work entirely in the box, mixing on the inbuilt speakers and checking bass on headphones like the HD25s. Q: Josh Egan As someone with as much industry knowledge as you have, do you feel it’s necessary to first build a decent following/fanbase before trying to get signed to a prominent label, even if you produce great quality music that fits their style? A: Sam Littlemore I believe the song is the most important. An act can launch into the stratosphere with 1 song. A fanbase may get you local gigs but it’s far more impressive to see a song spread around the country / globe and do the work for you. Even a prominent label doesn’t guarantee you success. The music business can be an ugly beast but when you have a hit song, watch that beast fight for you! Robbie Swan Best advice I’ve ever heard!! I need to just focus on productions and put my head down and write something extraordinary!! Q: Javi Cruz Hey Sam! Some suggestions or tips to get a top remix? When you remix, where do you start? A: Sam Littlemore Hey Javi, being asked to remix a big record is all about being flavour of the month. If you make an original song or a remix that resonates on dance floors, puts a song on radio or gets added to influential playlists on a streaming service, you are then going to be on the radar of a remix commissioner. I don’t really do remixes anymore as they take so much time to make them truly excellent. So unless you get publishing on a remix, it’s going to be unprofitable for you compared to a production or original song. When I start on a remix, I will write out all the melodies in MIDI and make sure all the musical elements are as strong as can be, vocal included. First step of making the actual remix is to work out what you’re trying to say, so you need to be creative now – it’s by far the hardest part. Then it’s all fun, making the elements fit together and sound cool. Klaus Hill will be closing this Q&A this evening….